1. What are the earliest (oldest) single-cell creatures called? 2. What is the only Lennon & McCartney song in which they did not write the lyrics? 3. What is different in the solar system at the end of the film and book '2010'? 4. Which European country's name stems from the Germanic word for 'foreign'? 6. What is the scientific name for plants that can store water? 7. Which so-called sport banned in many countries was practiced in Lord of the rings? 8. What did Joseph Conrad call the Congo? 9. What does Rayleigh scattering enable us to see? 10. Which 17th century painter's name is often associated with full-figured women? 1. Protozoa Protozoa (in Greek proto = first and zoa = animals) are single-celled eukaryotes (organisms whose cells have membrane-bound nuclei) that commonly show characteristics usually associated with animals, most notably mobility and heterotrophy. They are often grouped in the kingdom Protista together with the plant-like algae and fungus-like water moulds and slime moulds. In some newer schemes, however, most algae are classified in the kingdoms Plant and Chromista, and in such cases the remaining forms may be classified as a kingdom Protozoa. The name is misleading, since they are not animals (with the possible exception of the Myxozoa). 2. 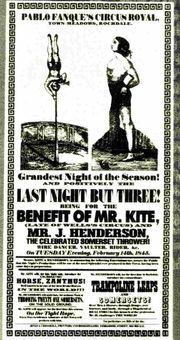 Being for the benifit of Mr. Kite "Being for the Benefit of Mr. Kite!" is a 1967 song from The Beatles album Sgt. Pepper's Lonely Hearts Club Band composed primarily by John Lennon with input from Paul McCartney and credited to Lennon/McCartney. Lennon wrote the song taking inspiration from a nineteenth century circus poster which he purchased in an antique shop in January or February of 1967, while filming the promotional video for the song "Strawberry Fields Forever" in Kent. One of the more musically complex songs on Sgt. Pepper, it was recorded on 17 February 1967 with overdubs on 20 February (organ sound effects), 28 March (harmonica, organ, guitar), 29 March (more organ sound effects), and 31 March. Lennon wanted the track to have a "carnival atmosphere", and told producer George Martin that he wanted "to smell the sawdust on the floor." In the middle eight bars, multiple recordings of fairground organs and calliope music were spliced together to attempt to produce this request; after a great deal of unsuccessful experimentation, George Martin instructed Geoff Emerick to chop the tape into pieces with scissors, throw them up in the air, and re-assemble them at random. 4. Wales The name "Wales", comes from a Germanic root word meaning (ironically) "stranger" or "foreigner," and as such is related to the names of several other European regions where Germanic peoples came into contact with indigenous non-Germanic cultures, including: Wallonia (Belgium), Valais (Switzerland), and Wallachia (Romania), as well as the "-wall" of Cornwall and even the "wal-" in the walnut tree. However, it has also been suggested that the prefix "Wall" acknowledges a people who had contact with the Roman empire. There are two words in modern Welsh for the English and this reflects the idea held by some that the modern English derive from various Germanic tribes (although there is little evidence for the extinction of the pre-Germanic inhabitants of England, and the idea ignores both the Scandinavian settlers in England and the Roman and Norman-French influences on English language, culture and identity): Saeson (singular: Sais), meaning originally Saxon; and: Eingl, denoting:-Angles,; meaning Englishmen in modern Welsh. The Welsh word for the English language is Saesneg, while the Welsh word for England is Lloegr. 5. Gigi Gigi is a 1958 motion picture musical set in Paris, France. The screenplay was written by Alan Jay Lerner and the music was composed by Alan Jay Lerner (lyrics) and Frederick Loewe (music). It is based on the bestselling novella of the same name by French author, Colette, which was first adapted for the screen with Dani?le Delorme in 1948. In 1951, Anita Loos adapted the novel as a play for the stage, and the Broadway production starred Audrey Hepburn in her first major role. Seven years later, producer Arthur Freed approached Lerner about writing a feature film musical adaptation. Gigi proved to be a major critical and commercial success and the winner of nine Academy Awards, including Best Picture. In 1991 Gigi was selected for preservation in the United States National Film Registry. It is considered the last great MGM musical, and the last great achievement of the Freed Unit, headed by producer Arthur Freed, although he would go on to produce several more films, including the musical Bells Are Ringing in 1960. The film also spawned a stage musical, produced on Broadway in 1973. 8. Heart of Darkness Heart of Darkness is a novella by Joseph Conrad. Before its 1902 publication, it appeared as a three-part series (1899) in Blackwood's Magazine. It is widely regarded as a significant work of English literature and part of the Western canon. This highly symbolic story is actually a story within a story, or frame narrative. It follows Charles Marlow as he recounts, at dusk and into the evening, his adventure into the Congo to a group of men aboard a ship anchored in the Thames Estuary. The story details an incident when Marlow, an Englishman, took a foreign assignment as a ferry-boat captain, employed by a Belgian trading company, on what readers may assume is the Congo River, in the Congo Free State, a private colony of King Leopold II; the country is never specifically named. Though his job is transporting ivory downriver, Marlow quickly develops an intense interest in investigating Kurtz, an ivory-procurement agent in the employ of the government. Kurtz has a reputation throughout the region.